Regimental Highland Dress, incorporating the military kilt. Within the British military, Regimental Highland Dress is very well known and respected. 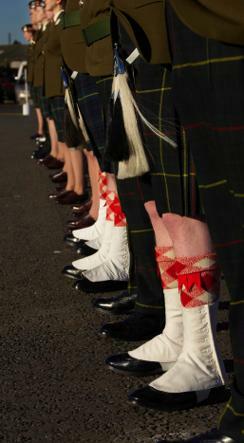 It dates back to the early eighteenth century, when the now world famous Black Watch regiment was formed. Since then many other Scottish Regiments have evolved, and served with distinction in the British armed forces. In fact we owe a huge debt to these Scottish Regiments, without whom kilts for men as we know them today would almost certainly have been lost to the world. Here you see three Scottish soldiers in their Regimental kilts. The reason being that after the last Jacobite rebellion in Scotland, the Government of the day saw fit to pass into law several acts designed to break the spirit of the rebellious Scottish Highlanders. One of these the "Dress Act" of 1756, made it illegal to wear the kilt or any other form of tartan, the two exceptions to this new law being the Gentry and the military. So in order for the Highlanders to be once again men wearing kilts, they had to enlist with a Scottish Regiment, thereby enabling them to wear Highland Dress. Below you can see a photo of a Scottish Regiment on parade in their kilts. Each Regiment was given their own distinctive tartan, which distinguished them from other Scottish Regiments. 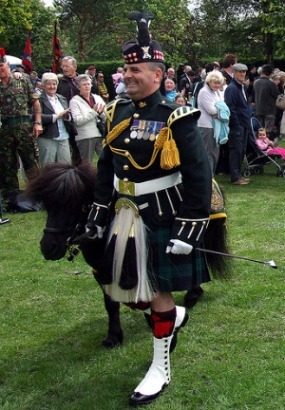 Below you can see a photo of Cruachan 111, who is the Regimental mascot belonging to The Argyll and Sutherland Highlanders, now 5 Scots, Royal Regiment of Scotland. But more importantly than the mascot, you can see the soldier wearing full Regimental Highland Dress. These Regiments as well as others not on the list, played a very large part in the successes of the British armed forces over the last few hundred years. 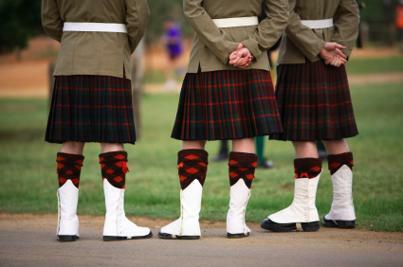 And the most distinctive feature of their uniform was without any doubt their military kilt. The kilt was last worn on the battlefield in 1940.